By Dan Ambrose: It looks like No.1 WBO Sadam Ali will have to wait a while before he gets his shot at the title because Top Rank promoter says he’s going to have his fighter WBO welterweight champion Tim Bradley (32-1-1, 12 KOs) defend his title next against No.3 WBO Brandon Rios. The World Boxing Organization will have to bless this move before Arum can go ahead and pull the trigger on the fight. Dan Rafael says the Bradley-Rios fight will likely take place before the end of the year sometime. 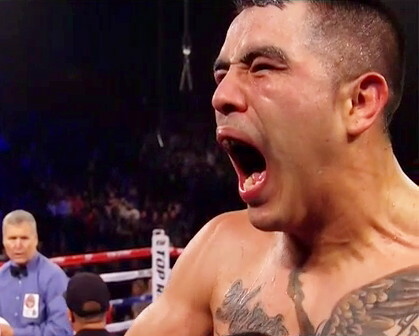 “Brandon Rios will be his next opponent,” Arum said via thaboxingvoice.com. Bradley barely escaped his last fight against Top Rank fighter Jessie Vargas last June when Bradley was hurt by a hard right hand in the last 30 seconds of the fight. He was then able to survive the remainder of the round, which ended early when referee Pat Russell ended the round prematurely by halting it with 6 seconds left after he mistook the 10 second bell to be the end of the fight. “No, there wasn’t enough time left. I don’t think he would have stopped him.” Arum said. By Arum saying that there wasn’t enough time left for Vargas to finish Bradley off, he’s basically ruling out a rematch between them. This isn’t surprising because it was a very one-sided fight until the last seconds and not particularly interesting to watch. Arum is better off matching Bradley with Rios then he is in putting Bradley back in with Vargas for another one-sided fight. It wouldn’t be surprising if Arum then matches the winner of the Bradley-Rios fight against Manny Pacquiao for another go around. “I think it’s probably more likely we’ll see Timmy against Brandon Rios by the end of the year,” Rafael said during his chat on Friday at ESPN.com. Rios has turned his career around by beating the past his best Mike Alvarado last January by a 3rd round knockout. What’s unclear is whether Rios improved or if his performance was merely a reflection of him being matched against a weak opponent. Rios certainly didn’t look good against Diego Chaves last year in winning a controversial 9th round disqualification victory. Rios was about to lose the fight when the referee Vic Draculitch stopped the fight in the 9th round of a 10 round contest due to Chaves supposedly having thrown an elbow. The disqualification saved Rios from another loss because he was behind in the fight and had no clue in how to fight Chaves. Before that, Rios was soundly beaten by Manny Pacquiao by a 12 round decision in 2013 in a tune-up bout for Pacquiao. Arum didn’t call it a tune-up bout for Pacquiao, but that’s pretty much what it was. Rios was recently in negotiations for a fight against IBF welterweight champion Kell Brook for a fight that would have taken place on September 12th at the O2 Arena in London, England. However, the negotiations fell apart over Brook’s desire for a rematch clause for the fight. It’s normal for champions to insist on rematch clauses in the contracts when making voluntary defenses , but in this case Rios and Top Rank didn’t want to deal with that.